To say that my fitness to do this walk was inadequate would not be true. I did it, and I did it on the planned schedule. However, it also could have been better. 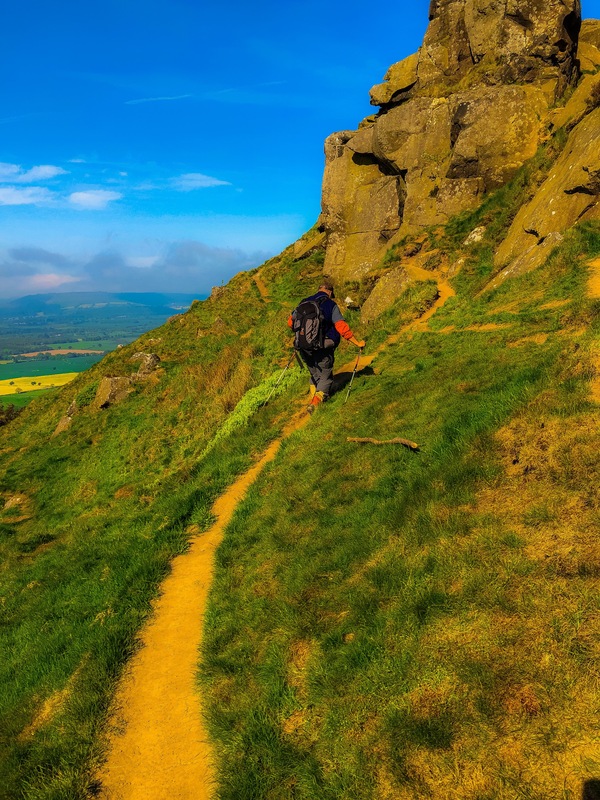 When I changed my cross-country walk from Switzerland to England, I pictured, instead of going up and down Alps, a long stroll through a kind of Henry Fielding Cotswolds countryside – gentle, green, rolling, picturesque. So, I was surprised at what the good Alfred Wainwright threw at us in his Coast-to-Coast Walk. Joel has hiked frequently in the US West, and I have hiked extensively in Switzerland. But, we both agreed that there were miles on this walk that were harder than we have ever done before. Joel was more fit. He is a bit younger and hasn’t been ill, but I don’t want to diminish his credit. He has exercised regularly his whole life. In fact, on the trail, I was a bit slow. It seemed as if most people were passing me up. I guess, I wouldn’t have seen the slower ones because they didn’t pass me up! This was discouraging at first, but then I remembered, or thought of, two things that encouraged me rather than discouraged me. The first is that I have come a long way since my illness. I was diagnosed with my leukemia a little over 3 years ago, and then spent 9 months basically on my back. All of my muscles disappeared. I have brought myself back to a point, where I have accomplished something that most of the population couldn’t, especially at 60+ years old. In longer conversations with fellow Coast-to-Coasters, I told them about my past and why making this walk was important to me. Everyone was incredibly encouraging. A surprising number of them had stories about friends and loved ones who had had leukemia. Many of those stories did not have happy endings. At the end of the walk, in Robin Hood’s Bay, one woman, from Leeds, England, started tearing up. She had lost someone close to her to a related illness that also required a stem cell transplant. I said I was so sorry, that I didn’t mean to upset her. She said, no, she was emotional because she was so happy for me, and that I survived and that I made this walk. 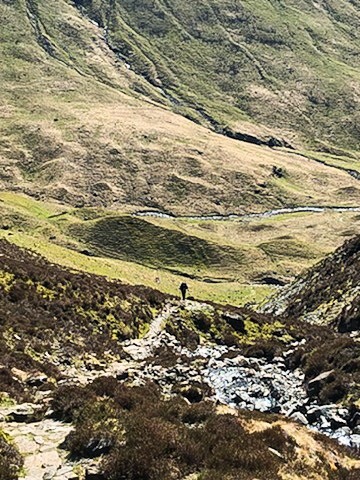 The second thing that was encouraging to me – I will say even inspiring – was the number of older people – in their 50s, 60s and 70s (maybe some older) – who were hiking across England, and who were powerful walkers! Talking with them, I would learn that this year they were doing the Coast-to-Coast, last year it was the Pennine Way, before that the tour around Mount Blanc, then the Camino de Santiago, then the climb up Kilimanjaro. These were truly exceptional older people, a rarified group, who – once, I learned their stories – inspired me rather than discouraged me. I want to be like them! There was Bob from Washington D.C., who booked his B&Bs for this walk last summer, before flying to Nepal to hike there. He is hiking from Grindelwald to the Matterhorn this fall. He looked possibly between 65 and even 75, who knows, but he walked as if he were a very fit 20. Jim – also in retirement – from Australia, walking with his son, would cruise past us every day. Joel may have kept up with many of these walkers, but he was a bit tied to me. But, I was not unhappy. I was still in the top percentage of people my age, because I could do this. To see and meet these other exceptional hikers and people was just plain inspiring. Of course, there were a number of young people on the trail, as well. I admired them for doing this walk. In a fast-moving, technically-overrun world, that has been their world for their whole lives, these young people chose to see England at a walking pace, step for step. The ones I talked to were equally remarkable to me, they were articulate, self-assured and appreciative of the landscapes and of what they were doing. The people I met became a big part of this walk for me. Toward the end, I began handing out my blogsite address to many of them. They may tune in some time and see pictures of where they have also been. My heart-felt “Greetings” to all of them visiting here! I had one main rule for the walk. 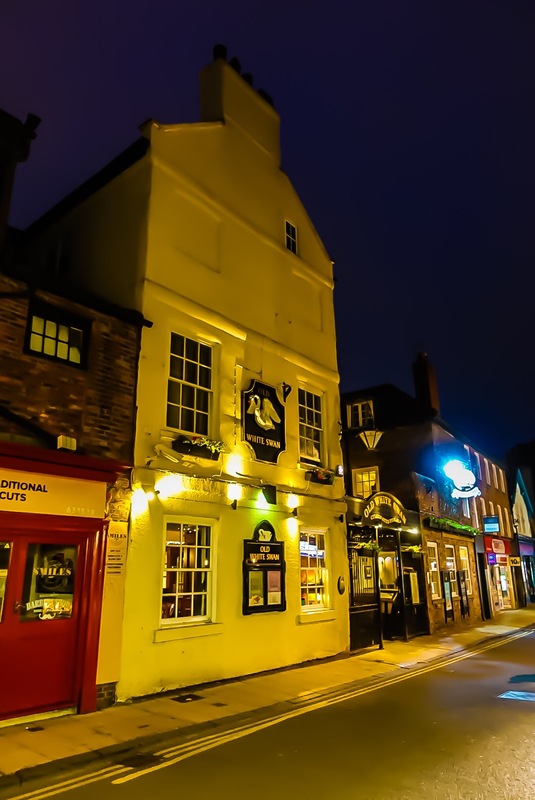 We had to walk across England in an unbroken line – no cheating, not even for a foot! Joel was completely on Bord with this rule. There were 3 B&Bs enough off the trail that we were supposed to call them for a pick-up, which we did. However, they had to drive us back the next morning to the exact point, where they picked us up. These off the trail B&Bs were unavoidable, and everyone using B&Bs had to book some like this. They turned out to be a couple of our nicest B&Bs, though, so it worked out well. The villages we passed through were often too small to have more than even one place to stay. We booked our B&Bs early enough to have almost all of our B&Bs on the trail, or a short distance off of it. At Clay Bank Top, there was nothing – just a road that intersected the trail. At a place called Wain Stones, we picked up a cellular signal and were able to arrange our pick up when we reached Clay Bank Top. Another, let’s call it, “rule” was that I was going to keep my blogposts up to date, and not slip. I wanted to bring everyone along, day by day. I missed this rule twice. The first time, I warned about in advance – we had our hilliest day and our longest day, back to back. As I suspected, all I could do was get to the B&B, shower, eat dinner and go to bed. After these two days, we had our rest day, so I caught up both missed days, and Joel wrote the rest-day entry. The other time I was late a day was when I fell asleep sitting upright at my iPad! When I woke up, I couldn’t get my brain to work, so I put it aside and went back to sleep. I caught that post up the next day. All of you reading the posts gave me the energy to keep current. I have over a hundred subscribers, and a large number of others, who just tuned in regularly. I know this from comments I received and from Joel telling me about who was following among his friends. I received comments on the site, but also on FaceBook and on LinkedIn. In fact, my first blog post on LinkedIn received – get this! – over 7,500 views! Each subsequent post had views in the 100s. That was also good, because views of my professional profile shot up into the 100s during these past 3 weeks, as well! I enjoyed writing the posts, particularly knowing that they were being read. I don’t really want to stop now, but I am not sure yet how to continue. I am not keen on keeping a blog reporting on “days in the life of Jeff”! I will make some thoughts about this. I may need to plan a new adventure! We ended the walk on an English bank holiday weekend, the sun was still shining, and the coast was packed. We wanted to extend our stay in Robin Hood’s Bay for a night and just decompress the whole next day. Additionally, some Coast-to-Coasters we met were intending to meet the following night at the Wainwright Pub. But, there wasn’t a room to be had anywhere, so we decided to head to a place, where there would be a straight train-shot to London. Joel’s flight was on Wednesday. 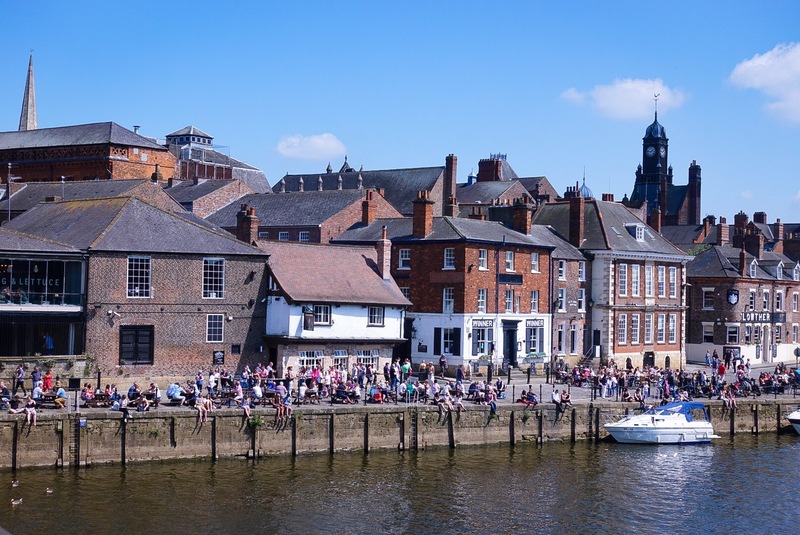 We checked around and found a hotel in York with a vacancy, right on the river, near the center of town. So, we headed there the next day. 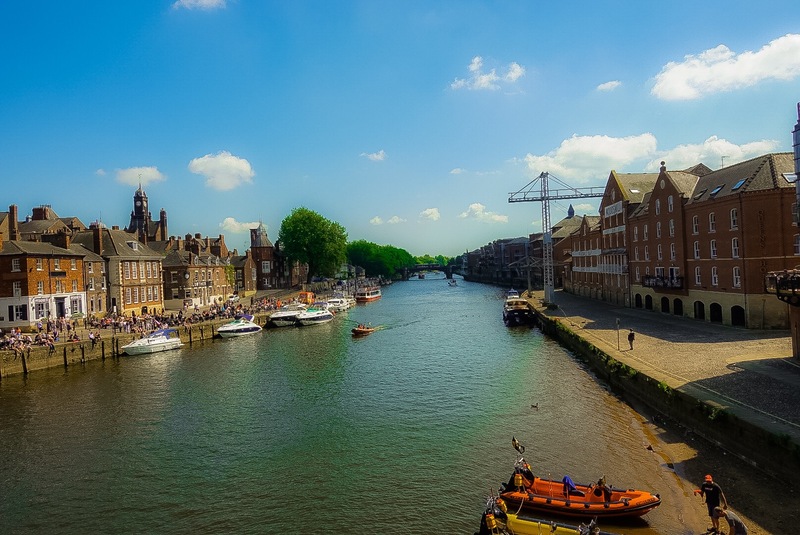 We arrived in York in the afternoon. Fortunately, Joel and I had been several times in York over the years, once also together, on our trip in 1981. 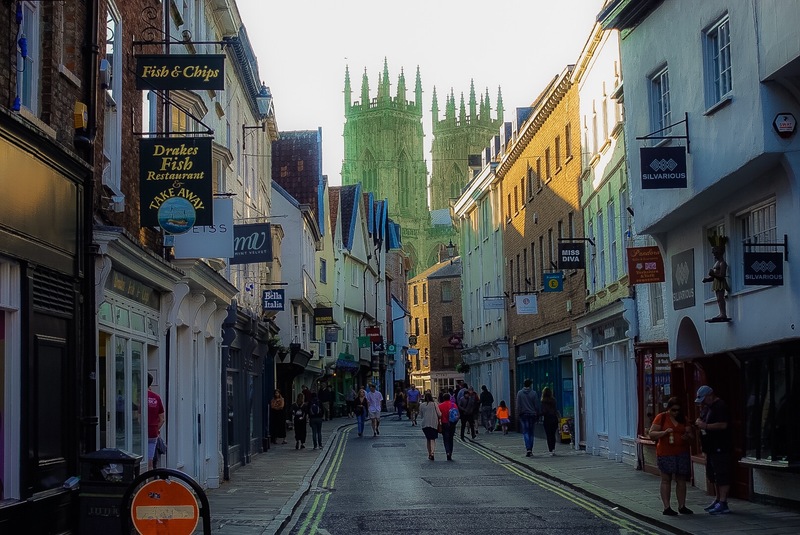 Therefore, we did not need to walk the city wall or visit York Cathedral or do other obligatory visitor things in the town. 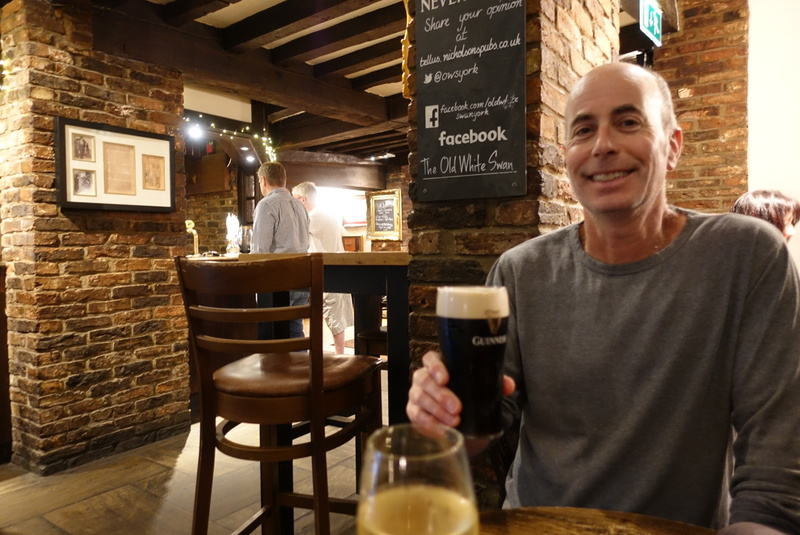 We went to an old pub by the riverfront and had a beer, then returned to the hotel for a nap before dinner. 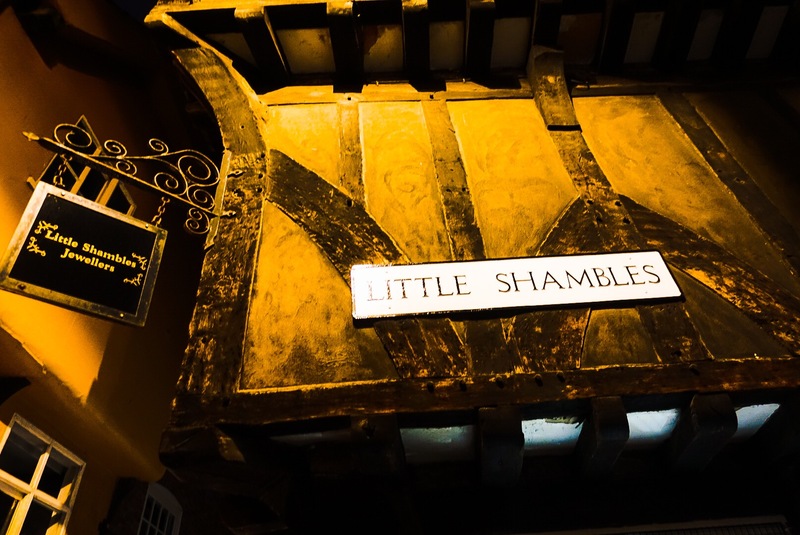 We wanted to find a good pub menu in or near The Shambles, which is an ancient street in York, where every building is leaning one way or another. 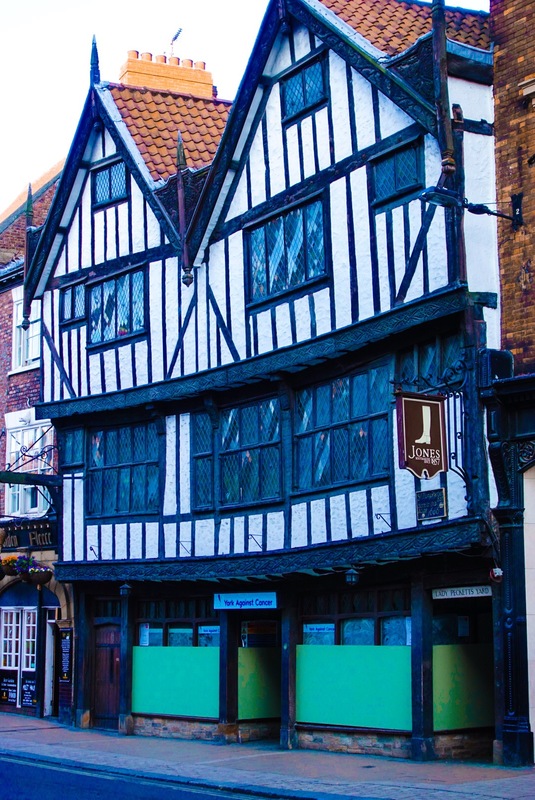 J. K. Rowling has family in York, and The Shambles was her inspiration for Diagon Alley in the Harry Potter books. 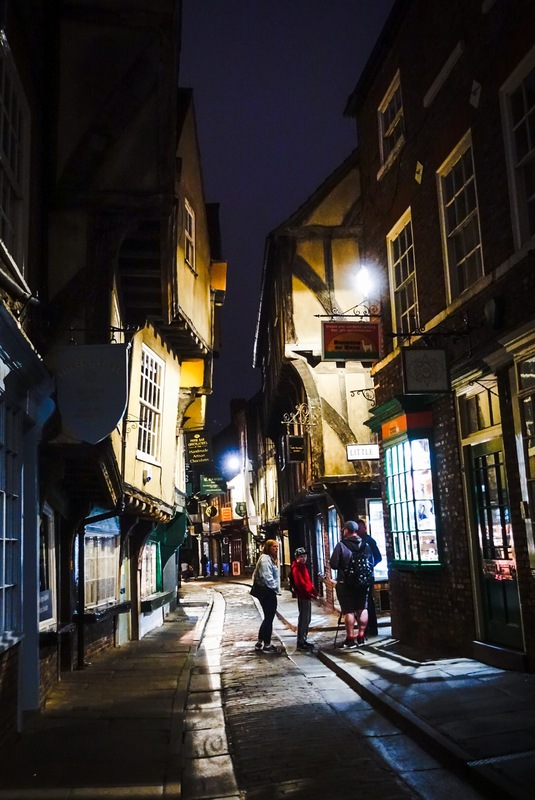 When they made the Harry Potter movies, set designers even went to York to take detailed measurements of the street. 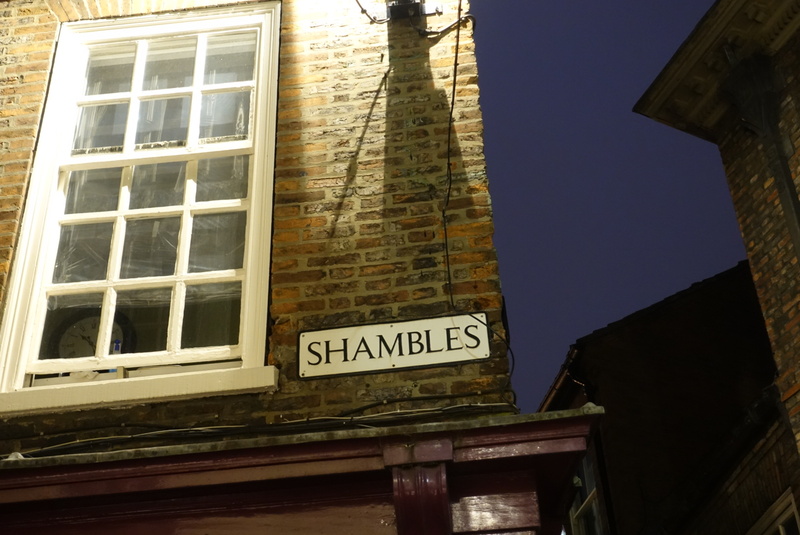 We found a 16th century pub, called the White Swan, which ticked off all of our boxes for dinner, just off the Shambles. Joel and I carried on the next day, which was Tuesday, to London. We found a pub next to King’s Cross Station, where we came in. 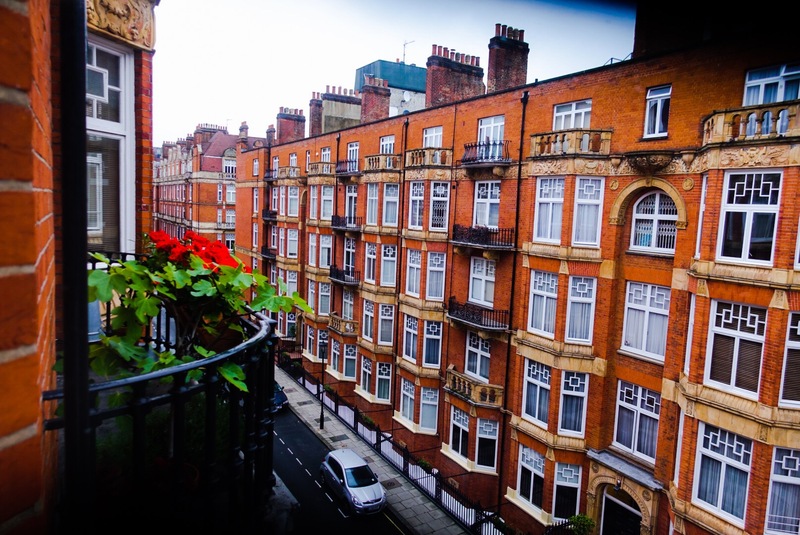 Joel was heading to a hotel in Paddington, next to the rail station with the Heathrow Express he would take the next morning for his flight. I headed to Marylebone, just a block off Baker Street, where my friends live. It is a beautiful area of London. My friends are having an unexpectedly crazy work week, but are – and have always been – so gracious and welcoming to me. Fantastic friends! I am hoping for some quality time with them on the weekend. My flight back to Michigan departs next Monday. I look forward to seeing family and friends back in Michigan, and I have some other projects in the works there, so I believe I will not have too much time to dwell on my Coast-to-Coast Walk being over. It was a great walk, Joel was a great walking companion, and our names are in the logbook at the Wainwright Pub in Robin Hood’s Bay. We are official Coast-to-Coasters, which is – by all measures – a high and well-earned honor! You are the MAN! Congratulations for now being a Coast-to-Coaster and good to see that you are enjoying life! At the same time, I am wondering what will be coming next but I am sure you will let us know, one day. Thanks, Alois! I am trying to think of what next. I have a couple of ideas, but I will put my feet up first and think them over! I am still in London, leaving tomorrow for the US. Hope all is well with you! 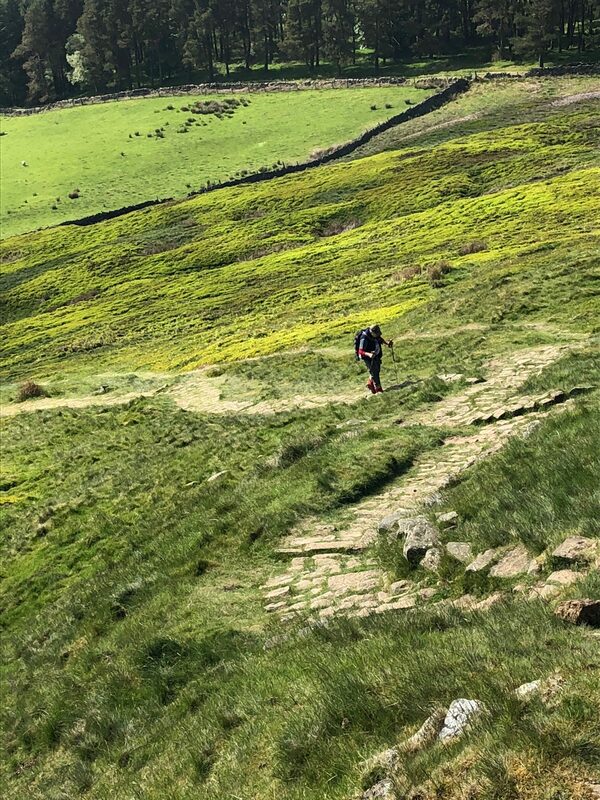 Previous Previous post: Day 17 – Egton Bridge to Robin Hood’s Bay – North Sea – Made it!